This padlock is sold without a lock cylinder. This option allows you to select the lock cylinder that works best for you. Please select the color of your Padlock body. KA=Keyed Alike -- all locks are opened by the same key. KD=Keyed Different -- all locks are opened by different keys. Please enter your current key number if you want these new locks to match your current locks. 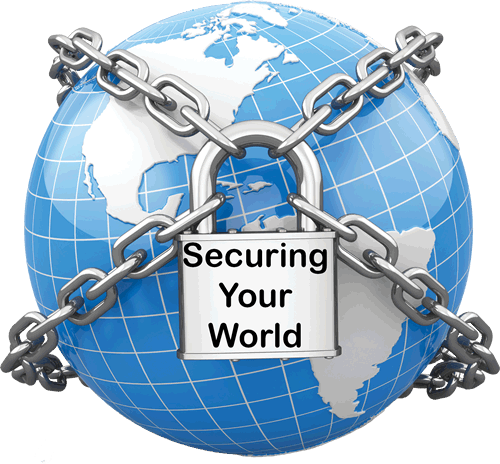 If you do not enter a number here we will generate a new SECURE key code. 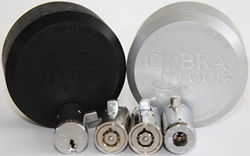 The Cobra ALUMINUM Universal PUCK® padlock is made of Machined Aluminum and has no visible shackle. It is available with the Cobra7, CobraMatic 7, Medeco or Abloy lock cylinder. Also available in either Silver or Black. Made in the USA. Comes standard with NO lock cylinder. Get 8-user changeable lock codes with the CobraMatic 7. Remember to order Keys with your padlocks. 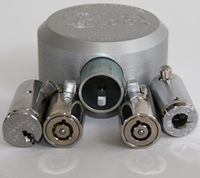 The Cobra 7 Lock Cylinder is a higher security replacement cylinder for traditional tubular locks. By using our patented 7- sided design we can increase the security of traditional locks. We add an anti-drill dimple to provide drill protection. The Medeco Lock Cylinder is a high security lock with patented key protection. Its UL approved design helps to protect against physical attacks such as drilling and cutting. This lock is virtually pick proof due to the precise interaction between the lock cylinder and the key. The Abloy Lock Cylinder is a high security lock with patented protection. The shell, face and locking bolt are all made of steel to provide exceptional drilling protection. This lock uses "Rotating Discs" instead of pins which gives it a very high resistance to environmental conditions such as rain and snow.